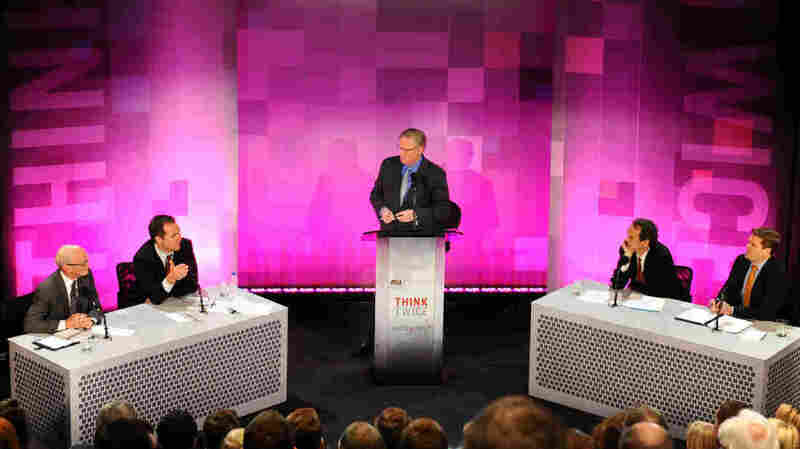 Debate: Does Spying Keep Us Safe? Some argue that spying on vast numbers of innocent people is a violation of privacy, as well as a waste of security resources. But others argue that mass electronic surveillance is vital to the fight against terrorism. 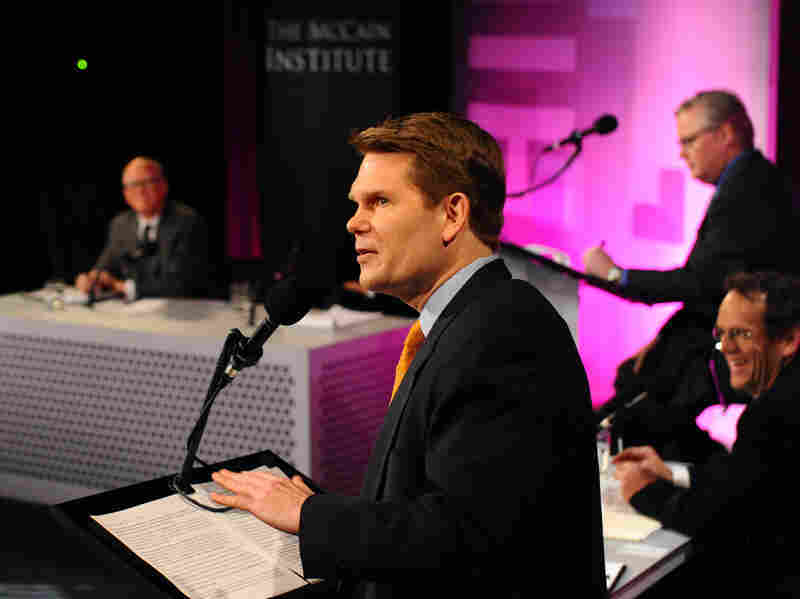 A team of experts debates for the latest Intelligence Squared U.S.
Stewart Baker and Richard Falkenrath face off against David Cole and Michael German in an Intelligence Squared debate moderated by John Donvan on Nov. 20. The recent revelations about National Security Agency surveillance programs have renewed the debate over the balance between national security and civil liberties. Some argue that mass electronic surveillance is vital to the fight against terrorism, even if it makes some people uneasy. But others say spying on vast numbers of innocent people is a violation of privacy, as well as a waste of security resources. A team of experts recently faced off on the topic of mass electronic surveillance in an Oxford-style debate for Intelligence Squared U.S. They debated two against two on the motion "Spy On Me, I'd Rather Be Safe." Before the debate, the audience in Washington, D.C., voted 26 percent in favor of the motion and 41 percent against, with 33 percent undecided. After the debate, 29 percent agreed with the motion "Spy On Me, I'd Rather Be Safe," and 62 percent disagreed — making the side arguing against the motion the winners. Stewart Baker practices law at Steptoe & Johnson, covering homeland security, cybersecurity, data protection, encryption, lawful intercepts, intelligence and law enforcement issues, and foreign investment regulation. He is the author of Skating on Stilts – Why We Aren't Stopping Tomorrow's Terrorism, a book on the security challenges posed by technology, and he writes on cybersecurity and privacy law at skatingonstilts.com. From 2005 to 2009, Baker was the first assistant secretary for policy at the Department of Homeland Security. During 2004 and 2005, Baker served as general counsel of the WMD Commission investigating intelligence failures prior to the Iraq war. From 1992 to 1994, he was general counsel of the National Security Agency, where he led NSA and interagency efforts to reform commercial encryption and computer security law and policy. His book on these topics, The Limits of Trust: Cryptography, Governments, and Electronic Commerce, analyzes encryption and authentication laws in dozens of countries. Richard Falkenrath, deputy assistant to President Bush and former deputy homeland security adviser, has held a range of leadership positions in U.S. counterterrorism efforts. The principal author of the National Strategy for Homeland Security, he served as senior director of policy and plans within the Office of Homeland Security after Sept. 11, 2001. From 2006 to 2010, he served as the New York City Police Department's deputy commissioner for counterterrorism, where he worked to strengthen the city's overall effort to prevent, prepare for and respond to terrorist attacks. Falkenrath is now a principal at the Chertoff Group, a global security and risk-management advisory firm; an adjunct senior fellow for counterterrorism and homeland security at the Council on Foreign Relations; and a contributing editor at Bloomberg News. Michael German argues against the motion "Spy On Me, I'd Rather Be Safe." David Cole is a professor at Georgetown University Law Center, a volunteer attorney for the Center for Constitutional Rights, the legal affairs correspondent for The Nation, and a regular contributor to The New York Review of Books. He is the author of seven books, including the American Book Award-winning Enemy Aliens: Double Standards and Constitutional Freedoms in the War on Terrorism. He has litigated many significant constitutional cases in the Supreme Court, including Texas v. Johnson and United States v. Eichman, which extended First Amendment protection to flagburning, and, most recently, Holder v. Humanitarian Law Project, which challenged the constitutionality of the statute prohibiting "material support" to terrorist groups. Cole has received numerous awards for his human rights work, including the inaugural Norman Dorsen Prize from the American Civil Liberties Union for lifetime commitment to civil liberties. Michael German is the senior policy counsel for the American Civil Liberties Union's Washington Legislative Office, where he develops policy positions and strategies concerning national security and open government. Prior to joining the ACLU, he served for 16 years as a special agent with the FBI, where he specialized in domestic terrorism and covert operations. He also served as an adjunct professor for law enforcement and terrorism at the National Defense University and is a senior fellow with GlobalSecurity.org. German's first book, Thinking Like a Terrorist, was published in January 2007.